Everyone is talking about 4:44, and no, it's not in reference to the 2011 movie about the last day of the world, but the meaning may be as earth-shattering. 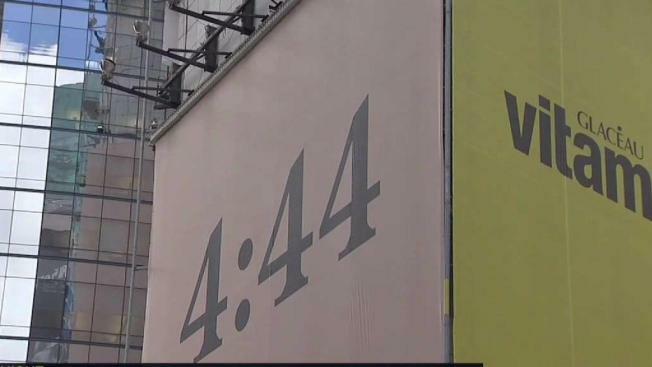 An enigmatic ad simply stating "4:44" with a beige or pink background has been popping up everywhere in New York and Los Angeles the past 24 hours, and the internet is abuzz with speculation about what it means. Many suggested Jay-Z is associated with the advertisement, and that it means he's going to release his new album very soon. The number four has great significance among Jay-Z and his wife, Beyoncé. It has been four years since his last album, "Magna Carta Holy Grail," which was released on July 4, 2013. The celebrity "supercouple" married on April 4, 2008. They also have matching "IV" tattoos on their ring fingers. Beyonce's fourth album was appropriately called "4." Also, Beyonce's birthday is September 4 and Jay Z’s is December 4. The ad was shown in Times Square as well as various subway stations, including Jay Street-MetroTech in Brooklyn. Jay Z was born in Bedford-Stuyvesant in Brooklyn. Neither musician's reps have commented on the mysterious ad.